A longstanding Las Vegas casino came crumbling to the ground early Tuesday, Ocean’s Eleven-style, due to a controlled implosion caught on camera. 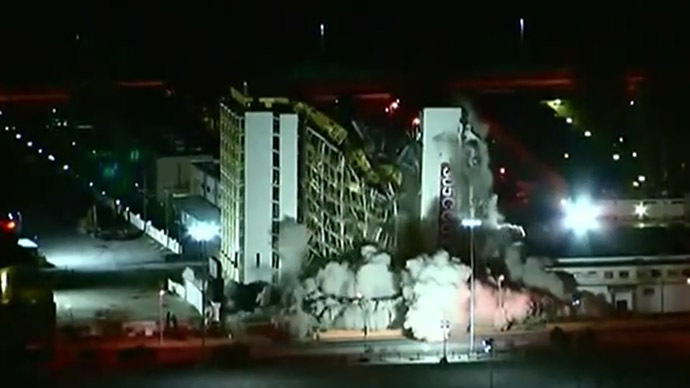 Video was rolling when a demolition crew collapsed the 12-story Clarion Hotel and Casino Tuesday morning in Sin City. The building originally opened in 1970 as the Royal Inn, a 200-room casino and hotel, and in the decades after it operated as the Greek Isles Hotel & Casino, the Royal Americana Hotel, The Paddlewheel Hotel Casino and an establishment named after one-time owner Debbie Reynolds, among other projects. The property closed for good last year, however, according to a local network KVVU, paving the way for this week’s demolition. At around 2:30 am local time Tuesday, the Clarion was reduced to rubble thanks to roughly 4,400 pounds of explosives used to take down almost all of the structure. An elevator shaft largely remained intact when all was said and done, however, and now a second blast is expected to soon be scheduled to clear out the rest of the 6-acre site. According to the Associated Press, the pre-dawn implosion marked the 13th time a Vegas hotel has been demolished for property owners to start anew. "Hopefully 13 will be a lucky number," Lorenzo Doumani, the site's new owner and developer, told AP. Speaking to the newswire, Doumani said he’s considering plans to put a 60-story hotel in place of the former Clarion, potentially making him someday the owner of the tallest occupied building in Clark County, Nevada’s most infamous city.